Sorry... the 2017 Lexus ES 300h is no longer being sold as new. Instead, take the first step to a great deal on 2019 Lexus ES 300h with a free price quote! 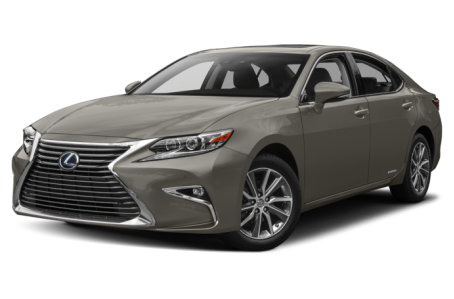 The 2017 Lexus ES 300h is the more fuel-efficient hybrid version of the midsize Lexus ES sedan. It competes with the Lincoln MKZ Hybrid and Infiniti Q50 Hybrid. This year, it remains largely unchanged. Like the ES 350, the ES 300h has tamer styling than most Lexus vehicles in the lineup. It has simpler body lines and plainer-looking headlights and taillights. However, it does feature a large, one-piece “spindle” grille for visual interest. Standard features include LED headlights, fog lights, heated side mirrors, a power moonroof, 17-inch alloy wheels, and dual exhaust tips that are integrated into the rear bumper. Bi-LED headlights, LED daytime running lamps and fog lights, a power trunk lid, and a panoramic moonroof are also available. Under the hood, the ES 300h is driven by a 200-hp, 2.5-liter 4-cylinder engine and two electric motors mated to a CVT. Inside, the ES 300h has a premium NuLux leatherette interior. The center stack features a standard 7-inch display audio system that includes a Remote Touch controller, Siri Eyes Free Mode, Bluetooth connectivity for phone and audio, and a USB port. It can be upgraded with an integrated navigation system, the Lexus Enform app suite, voice command recognition, and a Mark Levinson premium audio system. Standard features include automatic climate control and cruise control. Leather upholstery, genuine wood trim, a heated wood/leather steering wheel, heated/ventilated front seats, a memory seat, a power tilt/telescoping steering wheel, remote keyless entry are available as well. The Lexus Safety System Plus is now standard. It includes forward collision warning with automatic emergency braking, adaptive cruise control, lane departure warning and automatic high-beam headlights. Available features include a blindspot monitoring system and rear cross traffic alert.